The two-way radio is just as important to your kit when you are off on a trip, it means you can stay in touch with buddies when you’re not together. Of course, this is not going to be the only reason you may be wanting a set, they are invaluable forms of communication in a variety of settings. Security, safety, leisure and even simple pleasure are all reasons to choose a great two-way radio. The last thing you want when you need instant communication is a cell phone without a signal, or a loss of power that can hamper communications. The radio is portable, battery powered and simple to operate, they come into their own when you need to contact base. The best ten list has been appropriately chosen to highlight best sellers, best performance, and price. The aim is to take a little of the hard work out of shopping around for you. With the guide, there are a variety of makes and price ranges so there should be a two-way radio to suit all. The rest, as they say, will be up to you; individual circumstances may pre-determine what type you require. But as long as you have a good idea what your main reason for wanting a two-way radio is, then there is sure to be one in this list to accommodate your needs. This neat and tidy two-way radio is a fully programmable amateur radio that will provide ultimate communication when you most need it. Benefiting from low and high power settings, its frequency range is 65 - 108 MHz, (VHF 136 - 174 MHz (Rx/Tx). UHF 400 - 520 MHz (Rx/Tx).) It has a compact 4 x 8 x 5-inch size and is comfortable to hold, a great feature is the capability to receive commercial FM broadcasting. Provided with it is an AC adaptor 8.4V 600ma and a handy drop-in charger tray. This neat two-way radio comes with a handy belt clip and a wrist strap for ease of use and functionality when its required the most. It boasts a dual watch and dual reception for economical use, and it has a huge 128 name memory incorporated within it. 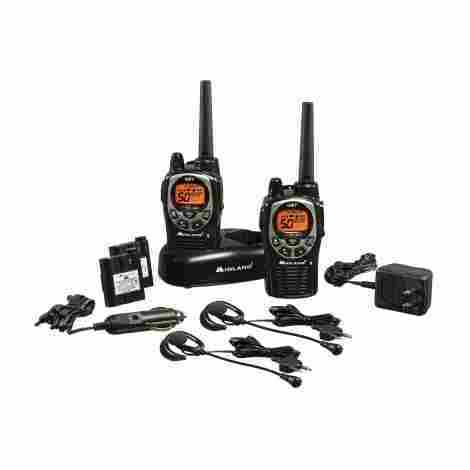 This Baofeng UV-5R has a selective choice of frequency steps that include 2.5, 5, 6.25, 10, 12.5 and 25 kHz. Its flexible antenna is female and the battery included is a BL-5 Li-ion. The device is adaptable to a great range of extra accessories that can enhance its performance further. This neat package is great value for money, the lower price allows standard use with the option to increase its overall performance, The handy features like the FM band and the clips and straps it has - make it an ideal general use two-way radio. 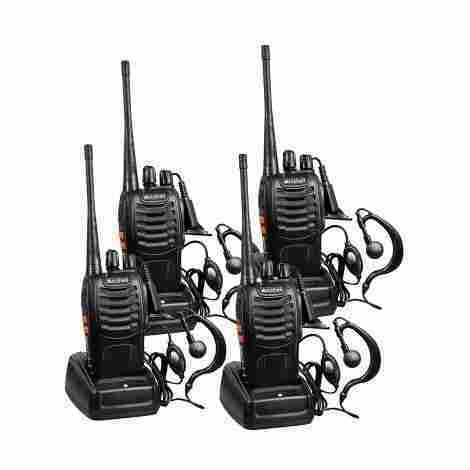 The Midland GXT 1000V P4 36-mile is available in various pack sizes which makes it an ideal purchase for any sized group where communication is vital. It benefits from 50 channels and boasts an up to a 36-mile range which enables distances covered to be greater without concerns over range loss. The full charge can last up to 11 hours and is powered with a 120V charger, and it has the added bonus of being water resistant which is one less thing to be concerned about when out and about in the isolated wilderness. This pair of two-way radios come with NOAA/All hazard weather channels, which includes an alert and also a vital weather scan. The inclement weather that may be encountered on trips makes it more important to have as much security as can be carried - this radio has an SOS siren which can be activated in the event of an emergency. A personal touch can be added, the two-way radio has 10 different alert tone so each tone can be assigned to different members of the group. Inbuilt are 142 privacy codes for convenience and added security, and it also has a vibrate alert with a hands-free option. 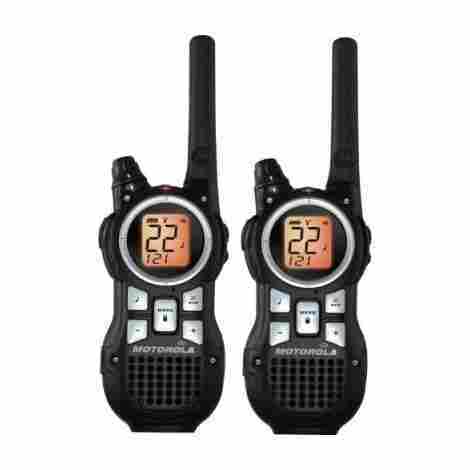 This twin set of two-way radios is excellent value when considering the superb features offered as standard. 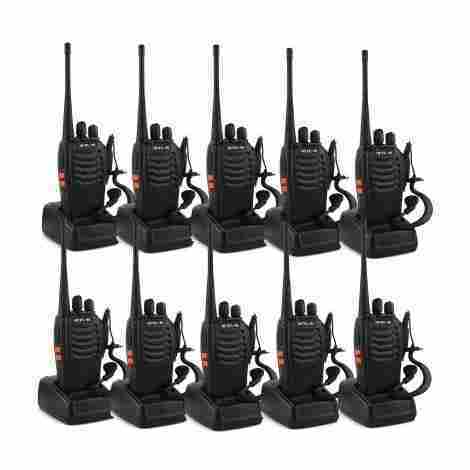 It isn’t the cheapest nor the most expensive but the mid-range set is a tidy, convenient two-way radio that has really useful features, all in all - it is a great value for the money. This Uniden MHS75 handheld is pre-programmed with all available United States and Canadian international VHF channels. It benefits from space to add up to 100 locations of your choice for quick and easy access. And for that unique touch that is highly recommended if it’s being used near the wet stuff - is it’s fully submersible for valuable peace of mind. The tidy, compact design is light to hold and won’t take up space in any backpack or kit bag, it has a bright LCD display so no more squinting to see what’s going on. For added peace of mind, this handheld two-way radio supports all NOAA weather channels and can raise awareness of any emergency including weather fluctuations. This is boosted by the ability to access two coast guard channels for weather and a marine channel. The Uniden handheld has the ability to be charged either by a standard 12 volt DC charger, universally with a cigarette lighter point, this is really useful when out and about and standard charging points are not available. The features that come as standard make this handheld submersible two way radio excellent value for money, the boost is achieved by it being waterproof and the security channeling will make it an ideal addition to any trip or workplace. 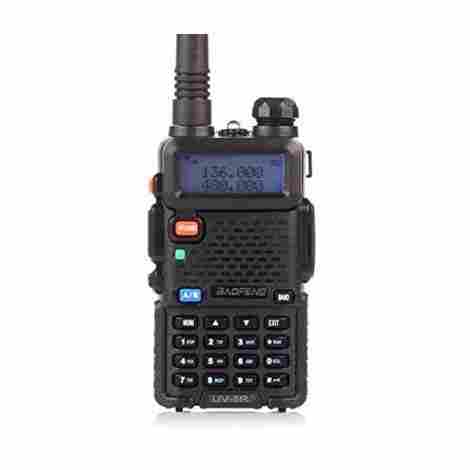 This Baofeng UV-5RA Ham Two Way Radio is available in a variety of pack sizes and has a frequency range of between 136-174 / 400-480MHz; 25KHz / 12.5KHz. It benefits from dual band display, dual frequency display, and dual standby. It comes with its own stand in the charger and it has a compact design that will not be cumbersome when out on the trail or in the workplace. As a point of the reference, this radio requires a license so be sure to make sure there’s one in place before it’s required. 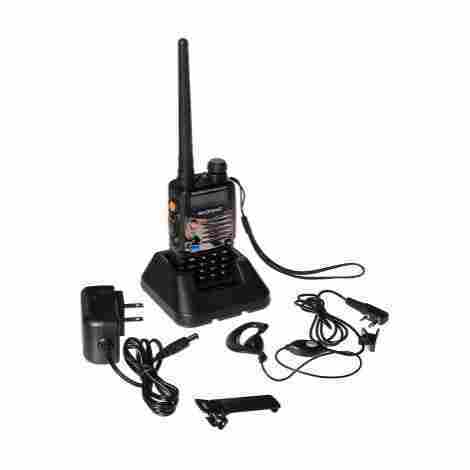 This two-way radio comes complete with a radio antenna, battery, battery charger and an earpiece/microphone. It also has an FM broadcast band so general listening is available when out and about, and as a boost, it has a useful battery saving function. Being only 15.2 oz in weight this two-way radio is light and comfortable to carry whenever the need arises. The scanning function is a boost and the power button is sufficiently stiff to prevent accidental adjustments when out and about, and its range is up with the best. The overall cost and value of this two-way radio are equally matched, the superior range it offers and the extra additions included in the purchase make this not only an ideal radio for isolated traveling, but it’s great value too. This neat two-way radio is a mere 4.3 inches in length and is compact enough to comfortably fit into the hand. It benefits from being water resistant and is simple enough to use for all ages. The frequency range is 400-470MHz and has 16 pre-programmed channels, this is boosted by a voice that can advise what channel is being accessed so frees up busy hands. The Arcshell allows the user to program any of the 50 CTCSS tones and 105 CDCSS tones on each available channel. It also comes equipped with a handy belt clip. The Arcshell Rechargeable Long Range two way radio has a 1500mAh Li-ion rechargeable battery with its own charging dock for convenience. The battery can be charged whilst in place on the radio, or on its own and offers a 2.5 hr charge time for up to 96 hours of life. The radio has a quality speaker built into it and has a push to talk button. It’s built-in mic gives crystal clear sound and also comes complete with an earpiece for convenience. It offers a flat range of up to 5 miles, although this may be less in built-up areas. The Arcshell Rechargeable Long Range two way radio is not the cheapest on the market, however; the extra features that come as standard such as the earpiece and charging dock, ensure that money spent on this radio is money well spent - great value. This Baofeng BF-888S Two Way Radio uses broadband (wide) 25khz and narrowband ( narrow) 12.5khz which is available for user choice. 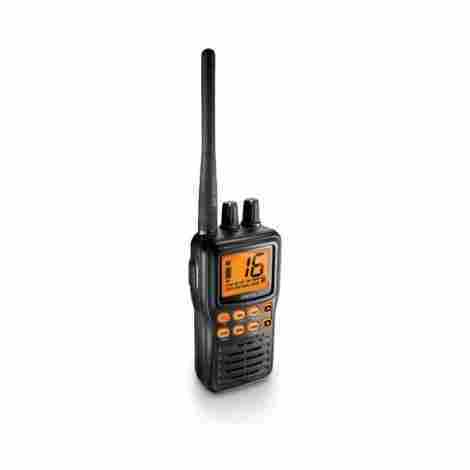 Its frequency mode is 400-470 MHz (Rx/Tx), and benefits from no less than 16 memory channels, 50/CTCSS and 105/CDCSS. 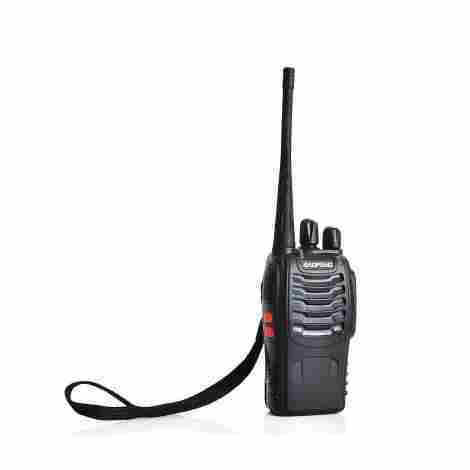 This 2-watt handheld radio is available as a single unit or a pair for a shared experience. The set also has a bright flashlight built in for even better versatility when out for long periods of time, an even better bonus is the accompanying emergency alarm for those just in case situations. This Baofeng has battery saving features and a low voltage alert for better peace of mind out in the wilderness. It benefits from VOX, monitor and scanning functions and a voice prompt built in for convenience and easy use, the speaker is 700mw on MHz. This unit uses intelligent charging and has a 1500mAh Li-ion battery, and offers up to three kilometers of range on a high setting. There is also the option to programme the radio with a suitable cable and software from any PC. For the set of two, the price on this radio is well matched for the standard inclusions, the features including the communication range, ensure that this purchase is great value for money, even when bought as a single unit - the value is there for the specification. 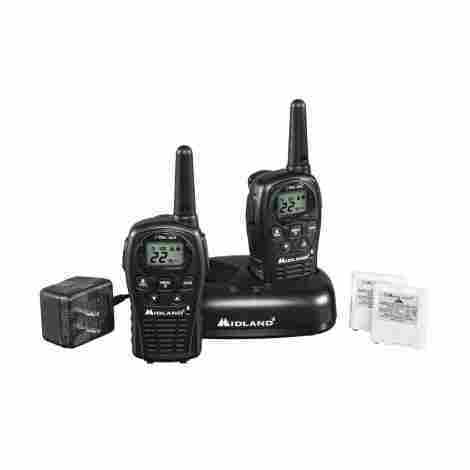 The Midland LXT500VP3 is a licensed radio service that provides a means to communicate in a lawful manner in the USA, this 22 channel two way radio is capable of reaching a range of up to 24 miles. It benefits from a channel scanner and has a call alert for great convenience, another boost is the choice between high and low settings. The value pack comes in a choice of two finishes - black and camouflage. The Midland comes with the choice of 4 x AAA batteries, or included in the pack are rechargeable battery packs. The battery life boasts being an impressive 16 hours and the different battery choices do not require any changes or upgrades. The lightweight two-way radio is only 1 oz in weight, and it comes complete with a docking station for easy charging. And a great bonus is the compatibility with other models such as the Midland LXT535. This value set has plenty of useful features, and the versatility it offers when choosing batteries increase the value. The docking station and compact design of the two way radio make it an excellent purchase for the money. This Retevis H-777 Two Way Radio set comprises 10 units with earpieces, charging docks, wall charging and USB adaptors, and a mobile charging unit. The frequency is set so that all the radios can communicate with each other and are ready to go straight from the box. And the selected frequency range is 400-470MHz, this is ideal for working groups when outside for long periods of time when communication is vital. It has a 16 channel memory and benefits from a low battery alarm, to boost this the Retevis H-777 Two Way Radio also has a power saving function for even more peace of mind when out on the job for long days/nights. The capacity for the batteries is 1000 mAh and comes with a high gain antenna, a great boost is the one year warranty that comes as standard and this model offers a cost-effective way to manage communication without compromising safety. Overall, the size of this Retevis H-777 Two Way Radio set, combined with the added products such as the earpieces, belt clips, and hand straps - this sound radio is light, compact and great value for money when the need arises for multiple users. The Motorola Talkabout Radio MH230R comes complete with 2 belt clips, 1 dual charger, 1 charging adapter and 2 (AAA) NiMH rechargeable battery packs. They are available in either yellow or pink and boast having dust protection and dripping water protection. The 22 channels have 121 privacy codes each which reduce interference and it can reach a range of up 23 miles in the open. The units have 11 weather channels with added alert features, and it can hold 10 hours of charge on alkaline batteries, or up to 8 hours on rechargeables. It is iVOX/VOX hands-free enabled for extra peace of mind when hands are full. The long life capabilities provided by these two-way radios ensure they will last a day when out on the trail and communication is vital. The wall charger is ideal for leaving the radios on charge overnight to sustain a full days use. 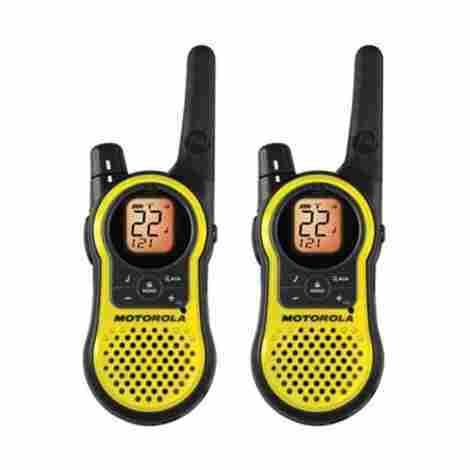 These Motorola Talkabout Radio MH230R sets are in the mid/high range but the versatility and functionality they offer balances out, the overall quality and durability of the set ensure that money spent on them - is money well spent. This mid/high range two-way radio boasts having a range of up to 35 miles, they each have 121 privacy codes for reduced interference on each of the 22 channels. It also has a vibracall alert with no less than 20 different call tones. It has 11 weather channels (7 NOAA) which also has alert features for valuable peace of mind when out and off the grid. Another benefit is the iVOX hands-free feature that does not require any audio accessory to enable it. The great range of features with these radios includes a built-in flashlight, PTT power boost, dual power and it is IP-51 rated. The range of the sets varies, up to two miles in built-up areas, up to six miles on open water and up to 35 in mountainous terrains. The Motorola MR350R 35 - Mile Range weighs in at 5.1 oz, and measures a neat 1.4 x 2.3 x 7.6 inches, light and compact it won’t take up valuable space in any backpack. It comes with the required three x AA batteries so is ready to go as soon as it arrives. The performance of this two-way radio set gives it equal footing on both value and cost, the peace of mind gained from the inbuilt alert systems makes the radios a valuable asset for any outdoor trip or working environment. There are a good few reasons to choose any of the two-way radios on the list, they all have unique and trusted capabilities that will stand you in good stead when you need to have a reliable source of communication. The priceless peace of mind you can have when you’re in need of security for whatever your chosen activity; will serve to make the trip even more enjoyable with one less thing to worry about. So, there you have it. Hopefully, this guide has provided you with enough information to enable you to have an easier time choosing your perfect two-way radio. Whether it is for pleasure, leisure or business the basic necessity for communication should be one less thing for you to have concerns over. Our modern two-way radios have actually been in the making for over a hundred years, first used by sailors as a basic form of communication from land to sea. The wireless telegraph was revolutionary in the process of introducing communication between two areas and was utilized through morse code. The ideas and reasons for use grew from a simple idea that was adopted by the military in the earlier part of the Twentieth Century, In the beginning, the units were hardly portable and much less convenient to pop into your backpack! They became more compact gradually and became widely used in aviation, with the reduction in size – came a greater versatility. Used by the military, the walkie-talkie was worn in a backpack and was cumbersome and generally took two to operate it in an emergency. The reduction in size gave it a perfect place for law enforcement and meant the police no longer had to rely on telephones to communicate. They were still large, however, and some taking up huge areas in the patrol cars, but technological advances continued and we are now blessed with completely handheld convenient devices. For the most part, you will probably think of a two-way radio and think of law enforcement or security. The concept of the two way communication is around us in many forms, even our cell phones are, in a way a two-way radio because of the speak/listen capabilities they have. Citizens Band Radio is another form, this highly popular source of communication is fun to use, and is often associated with truckers and taxis. Of course, for a lot of people who live in more isolated areas a CB radio is a firm base for important contact with others. The two-way radio in another form is found within a lot of our homes too, baby monitors use the technology to enable us to be with our young when we’re in another part of the house. And when we’re out and about, the security of knowing somebody is just a click away is a major important fact when we are in the wild. They are good ways to keep in contact with workers to – construction workers may find the invaluable location of colleagues a must when a site is large and cell phones have limited signal. Traditional analog radio systems are still very popular today, despite being a primary source of transmission and basic, it is commonly available. It has its limits, however, and the range of the clarity of communication is the main one. The further you move away from its maximum range, the less you will be able to communicate clearly, the sounds and transmissions become white noise which drowns any speech coming through. Modernity has given us digital advances so the ranges we can expect from a newer two-way radio will be larger compared to an analog type. And a bonus is that both analog and digital radios can be used from the same platform, you can have more than one conversation at any time, and background noise is reduced. They can be a little more time consuming to get you heard around but like most good things – it will be worth the wait once you’re up and running. So, you know you want to buy and use a two-way radio, you’ve sussed the instructions and know how to use your new gizmo, but how do you find a frequency so you can start flying over the airwaves? There are two main features that can affect your transmissions, one is your distance from a signal station, and another is obstructions in the path of the waves. UHF serves as a shorter wave and is very effective at shorter ranges, it isn’t very good on its own where the Earth’s natural curve creates an obstacle, VHF is the longer wave and can transmit well over distances and in open, level terrains. Digital radios offer the best of both worlds and give optimum sound quality. Q: Is there a difference between analog and digital two-way radios? A: Yes, a digital radio will give better sound quality and coverage, modern models will be able to use GPS technology which improves its functionality in a large variety of settings. Q: Do all two-way radios have the same range? A: No, if you use a regular day to day unlicensed model, your range can be anything from 1-3 kilometers – depending on your surroundings. If there are concrete, steel or other obstructions it may reduce the range you can expect. For a licensed model, power output is increased and consequently – range and coverage is increased. The licensed products available are ideal if you are using them for business purposes, or in built-up areas. Q: Why do 2-way radios have multiple channels? A: Each channel can be programmed to a different frequency. Modern 2-way radios typically have 4 – 16 channels, for listening to channel one you will only hear a broadcast that is being sent on that specific frequency. For radios used in business, the multiple channels mean you can have a channel set for different departments allowing free flow in different groupings. Q: What does a scanner function achieve? A: A scan is generally a business grade radio feature that instructs the radio to look for a channel that is active. This will, however, only pick up channels that are programmed into your radio, but once input, can make the use and set up much easier and quicker. Q: Do compact antennas work? A: Yes they do, the only difference is the way the antenna is produced, in a compact style – the antenna is simply a larger one but coiled. It can be restrictive on the range so if you are requiring a longer range, you should adjust your purchase accordingly. Q: Can I change the frequencies on my 2-way radios? A: Commonly two-way radios can be programmed from a laptop/PC and through onboard programming, you can’t however, change from VHF to UHF but you can scroll through available frequencies within the band of your radio. Q: I have a UHF and a VHF set, can they be used together? A. No, a UHF radio uses a different frequency to the VHF radio and therefore are not compatible to use together. Q: Are my transmissions private? A: If you buy an over the counter consumer-based model that doesn’t require a license – then yes, anybody can listen if they are tuned to the same frequency. If you are specifically looking for private business and/or commercial use, you would be better off purchasing a set with a license. Q: Are two-way radios waterproof? A: As a rule, unless specifically stated in the individual product specification, then it won’t be waterproof.